While it’s a traditional and popular combination, most red wines don’t actually pair that well with most cheeses. Red wine can be too tanniny and big to act as a complement, resulting in a diminishment of the cheese’s subtleties, while the cheese — not to be outdone — has a tendency to highlight the bitter components present in almost any bottle of red wine. If you’re a red wine lover, the shift to drinking white wine with a cheese plate most likely will not do. Fret not: A few subtle shifts can keep you happily in the red. From choosing softer grapes to eating bolder cheeses, pairings can happen that allow red wine and cheese to remain bedfellows. The qualities that make most people love red wine can be the same qualities that make it a lousy cheese partner — and acidity is one of those qualities. Acidity is a complicated component in some red wine, but not when it’s going to be enjoyed with cheese. A lot of popular and well-made cheeses are creamy and dense, and their resultant tendency to cling to your mouth and tongue when you eat them can require a wine that’s higher in acid to cut through that milky thickness. Red wines with a brighter flavor profile will work with a creamy cheese better than red wines lower in acid. Higher altitudes and cooler climates usually produce more acid. It’s why an Oregon pinot noir has more bite to it that a California one. When you want to go the higher-acid route to pair a wine with cheese, simply choose based on location. Wines from the Jura region of France, the Val d’Aosta region of Italy, Austria and Switzerland all tend to have a nice burst of acidity to them. Red wines that have a lot of fruit in them can do a great job of letting a cheese be, well, cheesy. Fruit can counterbalance a cheese’s saltiness or harmonize with its creaminess. Gamay and grenache are grapes that provide this quality (so pick a Beaujolais or a Côtes du Rhône), and pinot noir is a good choice for this category as well. Occasionally, you’ll come across an old vine zinfandel that’s pretty jammy, too. Tannins are what make a wine taste dry. A polyphenol that occurs naturally in plants, seeds, bark, leaves and fruit skins, tannins are bitter and astringent, which — when balanced well with other tastes — adds a nice complexity to a good wine. The tannins in red wine are from the grape juice’s contact with the skin, seeds and stems of the grape, all rich in tannins. Left alone, without the fatty, creamy influence of a cheese, tannins are great in a nice red wine, but with a cheese, that same good wine can be perceived as metallic. If you want to eat a triple-cream soft cheese, you’ll need to pick a red wine softer or lighter in tannins, and that can be tricky since all red wine is tannic to some degree. One quick cheat is to pick a wine that was aged in stainless steel barrels as opposed to oak, because oak adds tannins to red wine. You can pick older red wines, because tannins mellow as time passes. Rioja and Beaujolais also tend to be less tannic. When it comes to pairing red wine with cheese, it isn’t fair to make the wine do all the work of shape shifting. If you select cheeses that are strong, firm, hard and hearty, they’ll stand up to a red wine better than soft, subtle cheeses will. Salty cheeses also hold their own in a way that allows for a bigger red wine. To that end, aged, hard cheeses are an almost certain bet. Head toward aged Gouda, Cheddar, manchego and pecorino as these types of cheese can’t be bullied by most red wines. 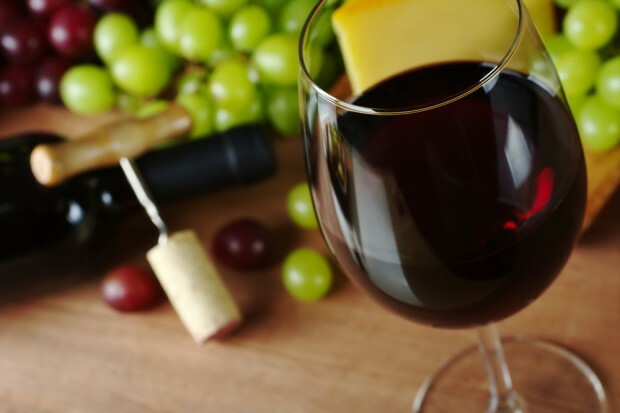 Drinking red wine with cheese is a tradition few wine and food lovers are willing to forego. With some willingness to compromise, the tradition can be improved to benefit the wine, the cheese and the ones partaking of both. About the Author: Stephanie Birch is a contributing writer who works at a winery in California.